Stream Ecosystems in a Changing Environment synthesizes the current understanding of stream ecosystem ecology, emphasizing nutrient cycling and carbon dynamics, and providing a forward-looking perspective regarding the response of stream ecosystems to environmental change. 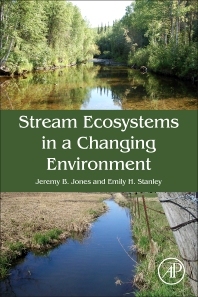 Each chapter includes a section focusing on anticipated and ongoing dynamics in stream ecosystems in a changing environment, along with hypotheses regarding controls on stream ecosystem functioning. The book, with its innovative sections, provides a bridge between papers published in peer-reviewed scientific journals and the findings of researchers in new areas of study. Jeremy B. Jones, Jr. studies land-water interactions, how processes occurring in terrestrial ecosystems impacts the movement of carbon and nutrients into streams, and how nutrients are used within stream ecosystems. His research has a particular focus in northern environments where climate change is thawing permafrost resulting in the release of carbon and nutrients from previously frozen soils, and altering the hydrologic connections between watersheds and streams. A central theme to this research is coupling between climate change, watershed and stream hydrology, and ecology. Emily H. Stanley studies the dynamics of carbon, nitrogen, and phosphorous in streams and rivers and how these nutrients are affected by human activities. These research interests have led her to investigate the physical and ecological effects of degradation caused by development of land and water resources as well as the effects of stream restoration. Many of the recent activities with her students and collaborators have focused on issues of excess nitrogen in agricultural landscapes, and on the effects of dam removals and other restoration projects in Midwestern US watersheds. A central theme of much of this research is the interaction between ecology, geomorphology, and hydrology in aquatic environments.